A quick word about the picture ... the version I'm reading is nearly identical to the one shown, except instead of cannon, it has a square knot. But I like the cannon! 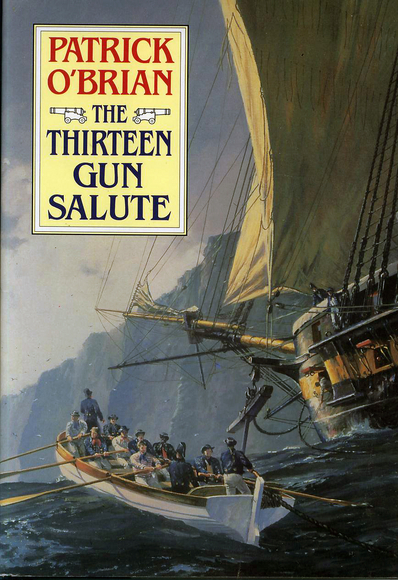 I've never seen a book cover with the cannon on it. As usual, I won't summarize the book. The Wikipedia entry does a perfect job summarizing this book. Stephen is a cold-blooded reptile when it comes to intelligence and revenge. After Ledward and Wray are banished from the court and shot in the heads, Stephen and a fellow intelligence agent dissect and dispose of their bodies! With their long voyage, Jack has ample time to teach and train his young officers. They have daily lessons on a variety of subjects. One of these subjects were "general knowledge and literacy." Jack had just given some feedback on a journal entry of one of the midshipmen and then asked him, "What do you know about the last American war?" "Not very much, sir, except that the French and Spaniards joined in and were finely served out for doing so." "Very true. Do you know how it began?" "Yes sir. It was about tea, which they did not choose to pay duty on. They called out No reproduction without copulation and tossed it into Boston harbour." Jack frowned, considered, and said, "Well, in any event they accomplished little or nothing at sea, that bout." Later, Jack asked Stephen about that battle cry to which Stephen told him the correct phrase! It was quite a witty passage! Overall - it was a boring book. Indeed there were parts that were exciting, shocking and amazing, but you had to endure extremely long stretch of seemingly unimportant minutiae. I'm finished with the 13th book (I wonder if POB intended that?) I'm going on a week and half vacation now and plan to take Nutmeg of Consolation with me to read. I've only 8 books left!